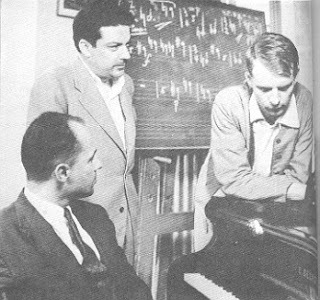 I find it fascinating to see photos of Boulez and Stockhausen together during the 1950s. It was such an exciting time for music. You can tell from the photos that both figures had a messianic zeal. You can tell that they engaged in power politics. To say that there were no rules would be way off the mark. True, they broke classical conventions. They mostly built their own dogmas - atonal, harshly dissonant, angular ones - and exhorted their acolytes to stick to them too. Strict rules had to be applied to pitch, timbre and dynamics as well as melody. This was deliberately cerebral music. It was advanced mathematics in the realm of sound. I find the post-war period between the 50s and 70s to be the most stimulating in the arts. What you find in the apogee of works by Boulez and Stockhausen is a complete lack of caution. The desire is to experiment and see what the results are. I find the current climate a bit depressing in this regard. Everything is so market-oriented that promoters don't want to try out anything risqué. Concentration-levels from the public seem to be lower, too. Many of my favourite authors who were first published around this time mention that they would never be published now (De Lillo, Pynchon, etc.). I find my chances of getting a novel published, for example, minute. Publishers want material that's marketable to a demographic and they want polish. They don't want something that's incautiously experimental. Boulez wrote a celebrated article called 'Schoenberg is dead.' It heralded the start of the new generation and the demise of pre-war composers. Boulez, in particular, was ferociously fundamentalist, and even a bully, when promoting his music. He wrote an article where he stated that 'anyone who doesn't adopt the twelve-tone row is useless.' He even called for all opera houses to be burned down at one point. I find it amusing how the careers of Boulez and Stockhausen took such divergent routes. Stockhausen became a hippie mystic. He retreated into a hermitage and hardly ever addressed the press. His music became more and more ludicrous and megalomaniacal. His public statements became even more abstruse. Boulez became an establishment figure and a public treasure. He mellowed out a lot. No longer the partisan composer at war with everyone, he became a renowned conductor of romantic as well as modern music. Now that Boulez is dead, that generation of composers is completely gone. It's the end of an era. Within music, that post-modern cliché still applies: everything has already been done, so let's treat everything ironically. How wonderful if we saw more composers as visionary, as angry and reckless as Boulez and Stockhausen reappear.